Don't engineer by coincidence-design it like you mean it! Filled with practical techniques, Design It! 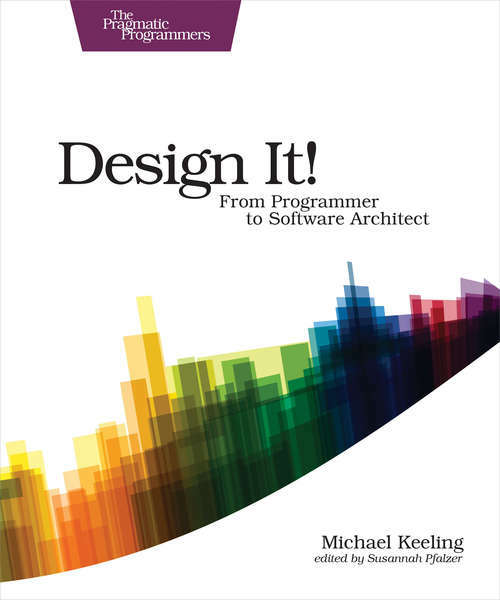 is the perfect introduction to software architecture for programmers who are ready to grow their design skills. Lead your team as a software architect, ask the right stakeholders the right questions, explore design options, and help your team implement a system that promotes the right -ilities. Share your design decisions, facilitate collaborative design workshops that are fast, effective, and fun-and develop more awesome software!With dozens of design methods, examples, and practical know-how, Design It! shows you how to become a software architect. Walk through the core concepts every architect must know, discover how to apply them, and learn a variety of skills that will make you a better programmer, leader, and designer. Uncover the big ideas behind software architecture and gain confidence working on projects big and small. Plan, design, implement, and evaluate software architectures and collaborate with your team, stakeholders, and other architects. Identify the right stakeholders and understand their needs, dig for architecturally significant requirements, write amazing quality attribute scenarios, and make confident decisions. Choose technologies based on their architectural impact, facilitate architecture-centric design workshops, and evaluate architectures using lightweight, effective methods. Write lean architecture descriptions people love to read. Run an architecture design studio, implement the architecture you've designed, and grow your team's architectural knowledge. Good design requires good communication. Talk about your software architecture with stakeholders using whiteboards, documents, and code, and apply architecture-focused design methods in your day-to-day practice. Hands-on exercises, real-world scenarios, and practical team-based decision-making tools will get everyone on board and give you the experience you need to become a confident software architect.